CHICCHAN is the “lightning in the blood,” the force within the Seed that brings it to life. CHICCHAN is the Spark of the Creator that is seeded within us. Through our relationship with the Creator, we can become Conscious of our own Divine Power. Tone 2 presents us with the Choice of a Creation “to be, or not to be.” Tone 2 holds the Intention of Duality. Duality reflects our Human way of understanding by comparing the difference between one thing and another. The Seed/KAN trecena is leading a journey of discovering our own Divine Design for our experience of Being. Seed/KAN offers the guidance of Serpent/CHICCHAN to ignite the Spark of the Force of Creation. CHICCHAN brings the gift of an Inner Knowing of our own Power to Create the world we Choose. God created the design for the whole world. A Divine Consciousness is the Alpha and Omega, the first and last. An Omnipotent Creator holds the power to see everything from the beginning to the end. CHICCHAN can help us Know that the plans for “everything that could be” is seeded within us. Serpent/CHICCHAN can ignite our Dream of Being through a Gift of Knowing its possible. The Serpent navigates by “feel.” The Serpent uses its sense of vibration through Mother Earth to Know the nearness of it’s prize. It doesn’t rely on sight or sound, but a sense of Inner Knowing it feels in the body. CHICCHAN is the very Force of Life that empowers ALL our gifts of Knowing. We will be empowered to create a new world of experience by “feeling” our way in Spirit. CHICCHAN holds the Power to Awaken all the Divine Senses within our Self. We will Know our direction forward by our Sixth Sense. Therein lie all our Powers of Creation by Knowing the Power of the Intention we Choose. Creating the world of our experience is the Highest Meaning and Purpose of our Power to Create. The Creator insured that Human was capable to Create a reality of Happiness and Love. We would never find it by looking to worldly sources of power around us. The Creator never intended our Dream to be dependent on someone else. We don’t hold Authority over the dreams of others, only our own. We will only find our way by looking to our own resources within. CHICCHAN ignites the Force of Knowing our Power to Create. Clairvoyance is a natural and normal by-product of holding the Power of Creation. As we recognize our own Power to Create, we can see that we are the Creators of our own Future. We can know the future by our own Intention. God Knew there would be Light in the future, because Light was an Intention of Creation. Human was created to design our own future. No Human could define the future of another without limiting the choice of All Possibility. Our Free Will doesn’t rely on the Choices made by another Human. The Spark we were given empowers us to define our own future by the Intention of Spirit. Our future is determined within. The Seed/KAN trecena can free us of the snares that would prevent us from reaching the Light of our own Creation. CHICCHAN empowers a Choice to follow our own path, believing in our own Senses to find the way through and around any obstacles we meet. This is a day to pay attention to your own gifts of Knowing. CHICCHAN is a whole-body experience of Knowing, related to the Kundalini energy that travels up our spine. CHICCHAN is that energy within that, like a charge of electricity, ignites our whole being of Knowing. The Consciousness that is shared by CHICCHAN is a body and soul experience. The Tzolk’in calendar tracks the evolution of Human Consciousness. The Tun 360-day calendar is the Maya’s calendar of prophecy. The Tun charts the acceleration of transformation. What human might discern as as “time speeding up” is an acceleration of experiences and choices. Once the choices for a cup of coffee were regular or decaf, sugar and/or cream. The calendars foretold a time of acceleration when there would be too many choices for a mind of reason to discern. Human would be forced by necessity to rely on a telepathic means of discernment. Down through history the Serpent has been a symbol of Enlightenment and Illumination. Today we are given a choice. Tone 1 inspired us to a new climb of Spiritual Growth, an Intention to Create our own reality. We are guided to make a choice to believe in our Self and our Connection to the Creator. Tone 2 can bring a feeling of separation as we are separated from Unity to Know what our own creation would be. We might feel a longing to be One as we see the way we are different than others. We long to be equal, no more or less capable to create than someone else. It’s easy to believe that someone else can manifest their dream easier than we can. The Serpent is never bound by the snares of fear. CHICCHAN will offer us a tangible experience of seeing beyond an illusion of our Powerlessness. We only have to remember that the question is not whether or not we can create the Dream. We only have to ask if our Intention is worthy. When we Know that the Love expressed through creation will send ripples of Love to the Whole, we can stand in the Truth of a Divine Purpose. This is an important trecena for inner reflection. We won’t find the answers we seek outside of our Self. We exist in the chaos of creation. We can’t discern the Truth from the way things look around us. NOW is a worthy experience. We’ll share the Wisdom of the Experience with the new Seed. We can establish the way as believing in our own sense of direction in the dark, knowing that a New Light will shine even brighter than the last. Each climb of Spiritual Growth is meant to push us beyond the limits we’ve known before. This is such an important climb. It’s not so hard. Our Human effort is a 6-day journey. Then we will be lifted by Divine Intervention. This is a time to hold Faith in a Promise of ending up in the Light. CHICCHAN will help us Know we are still on course, and that we are guided by a Force and Vibration of Divine Guidance. We can believe that every experience holds a Divine Meaning and Purpose. This summer was forecast as a turbulent passage. We can defy the illusion as false truth appearing real. When we reach the other side, we will hold a new Inner Strength of Believing. Astrologically, our turning point is August 27. We will be prepared for new movement forward, and lifted by 12 Eagle/MEN to a Higher Understanding. To all my relations, may we allow the darkness around us “to be” without claiming it as our own. May we rely on the Light of our own Spirit. May we believe in a dream of emancipation, released from the strongholds of our past. May we hold Faith that all the obstacles of false truth will be burned away as the Creator Fires the Seed of our Dreams. May we hold the Intention of Faith in our Self, Knowing that our Divine Justice planned by the Creator is Faith Transformed into Believing. Remembering Aretha Franklin: Born March 25, 1942, Aretha’s Destiny Kin is 9 Crocodile/IMIX, a Heart of Compassionate Love. Those born IMIX who follow their passion are said to be seen as Genius by the world around them. The whole world was touched by Aretha Franklin’s dream. She was a voice of inspiration and a blessing to Humanity. She didn’t set out on a mission to change the world. Her Gift to the Whole was the by-product of Loving her own Dream. Her Gift was a Blessing of CHICCHAN, the Power to move us Body and Soul. Thank you Aretha for your gift that will carry on. Rest in Peace. I’m grateful for the Spiritual Gifts the Creator Intended for Human to Know, and grateful that a Power greater than myself Promised we would Know. Thank you once again for these words, they are more comforting to me than I can properly express. I’m an 11 Jaguar, born in this trecena and I am feeling it all so much. 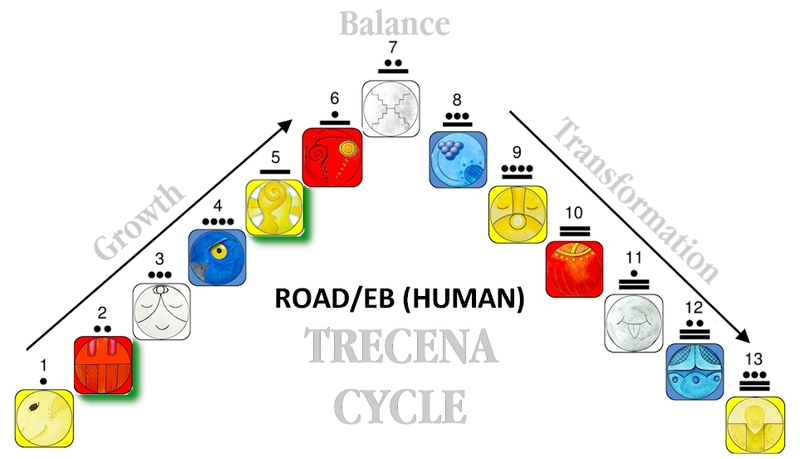 Do you approach the trecena of your birth any differently? One day I will repay you for all of your guidance, I appreciate it so much. They do all seem special it’s true. As for mine sometimes it makes perfect sense and sometimes I feel like I couldn’t understand it less. But I know the next few steps at least. And I’ve learned how to find my way back when I wander a less desirable direction. You’re a big part of that! Lol probably most of the time it makes sense is after I finish reading your words and they’re so reliably there it just means so much to me. So thanks again, a million times.